The molecular force of blood-stage infection (molFOB) is a quantitative surrogate metric for malaria transmission at population level and for exposure at individual level. Relationships between molFOB, parasite prevalence and clinical incidence were assessed in a treatment-to-reinfection cohort, where P.vivax (Pv) hypnozoites were eliminated in half the children by primaquine (PQ). Discounting relapses, children acquired equal numbers of new P. falciparum (Pf) and Pv blood-stage infections/year (Pf-molFOB = 0–18, Pv-molFOB = 0–23) resulting in comparable spatial and temporal patterns in incidence and prevalence of infections. Including relapses, Pv-molFOB increased >3 fold (relative to PQ-treated children) showing greater heterogeneity at individual (Pv-molFOB = 0–36) and village levels. Pf- and Pv-molFOB were strongly associated with clinical episode risk. Yearly Pf clinical incidence rate (IR = 0.28) was higher than for Pv (IR = 0.12) despite lower Pf-molFOB. 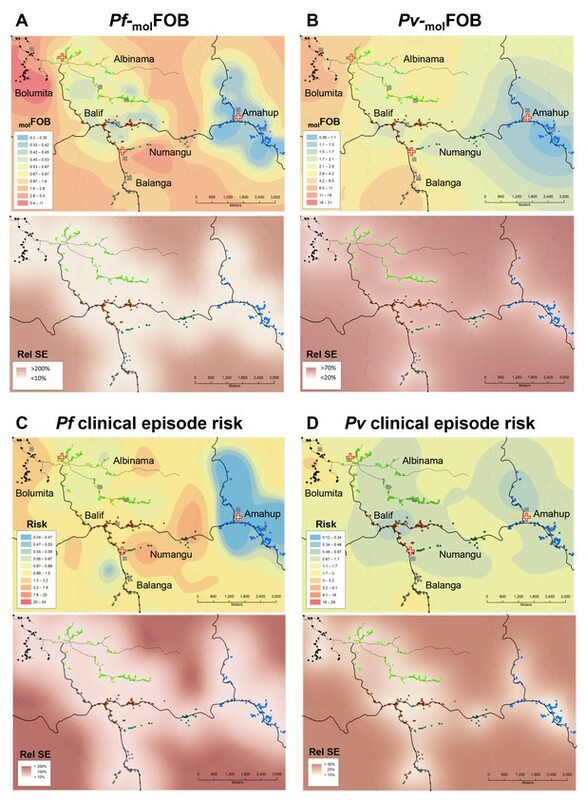 These relationships between molFOB, clinical incidence and parasite prevalence reveal a comparable decline in Pf and Pv transmission that is normally hidden by the high burden of Pv relapses. Malaria is caused by five different species of parasites that are transmitted to humans by bites from parasite-carrying mosquitos. Once in human blood, the parasites rapidly multiply. People who live in countries where malaria is common may become infected and never show any symptoms because their immune systems are able to keep parasite numbers low. Repeated infections, or infection with more than one species of malaria parasite also are common. Some species of malaria, including Plasmodium vivax, can hibernate in the liver for weeks or months after the infection and only become active later. Asymptomatic infections, multi-parasite infections, and reactivating parasites make it hard to measure how often new malaria infections occur. One way scientists can determine if a new infection has occurred is by genotyping the parasites in a person’s blood. Genotyping involves looking for small differences in the parasite DNA. For example, a study in Papua New Guinea, where P. vivax is very common, showed that reactivations of hibernating parasites were more common than new infections. Now, Hofmann et al. use the same study in Papua New Guinea to compare the frequency and consequences of new infections with P. vivax and another malaria parasite, Plasmodium falciparum. In the study, 466 children from 6 villages were followed for 8 months with tests every 2 to 4 weeks to genotype the parasites in their blood. Some of the children were treated with antimalarial drugs to help wipe out any existing parasites including hibernating ones. While P. vivax was about twice as common in blood samples—likely due to reactivation—genotyping showed that new infections with the two parasites occur at equal rates and often at the same times and locations. Hofmann et al. also showed that some villages and some children had much higher rates of infection than others. This difference could not fully be explained by use of bednets or other preventive measures. Children were more likely to become ill from P. falciparum than P. vivax even though P. vivax was more common. But children with more frequent infections with P. falciparum seemed better able to manage the parasites and were less likely to develop symptoms that those with infrequent infections. The experiments show that genotyping may help scientists better track new malaria infections and develop better strategies to prevent or treat malaria. Renewed emphasis on malaria control has resulted in substantial reductions in overall malaria prevalence and incidence in many endemic countries (World Health Organization, 2015). However, where transmission persists, it is highly heterogeneous even on small spatial scales (Bousema et al., 2012). Individual exposure is further influenced by factors such as use of bednets, attractiveness to mosquitoes, or behavioural differences. In Papua New Guinea (PNG), malaria prevalence has sharply declined in the last decade, largely as a result of two nationwide distributions of long-lasting insecticide treated bednets (LLIN) (Hetzel et al., 2015; Hetzel et al., 2014; Hetzel et al., 2012). P. vivax and P. falciparum PCR-prevalence in the general population was reduced from 32% and 39% in 2006 to 13% and 18% in 2010 (Koepfli et al., 2015). Already before this decline in malaria prevalence, studies in PNG had reported significant heterogeneity in malaria transmission attributed to local population structure and geographical diversity (Hetzel et al., 2015; Cattani et al., 1986; Genton et al., 1995; Müller et al., 2003; Mueller et al., 2009a). Prior to the up-scaling of malaria control, P. vivax endemicity in PNG was among the highest worldwide (Hetzel et al., 2015). Clinical immunity to P. vivax was acquired very rapidly in PNG children, and the incidence of P. vivax clinical episodes peaked in children younger than two years with only very few P. vivax clinical episodes reported in children older than 5 years or adults (Genton et al., 2008; Michon et al., 2007; Lin et al., 2010; Betuela et al., 2012). In contrast, the risk for uncomplicated P. falciparum clinical episodes increased during early childhood (Lin et al., 2010) and significant reductions in incidence of clinical episodes or high-density infections were only observed in children aged 5 years and older (Michon et al., 2007). Compared to the incidence of clinical malaria, prevalence of P. falciparum and P. vivax peaked in older age groups, with asymptomatic infections remaining common until adulthood in PNG (Koepfli et al., 2015; Mueller et al., 2009a). Concordant with the species-specific pattern in the burden of clinical episodes, P. vivax prevalence peaked in younger age groups than P. falciparum prevalence (Koepfli et al., 2015; Mueller et al., 2009a). As malaria transmission declines, it is important to understand the resulting changes in malaria prevalence and clinical incidence patterns, as well as the extent of heterogeneity in transmission within malaria endemic regions so that high-risk areas can be identified and targeted (Mosha et al., 2014). Most attempts to delineate high and low transmission areas made to-date, by both researchers and control programs, have used passive case surveillance or cross-sectional malaria indicator surveys. These surveillance strategies result in clinical incidence and prevalence estimates, both of which are surrogate markers for transmission. A more accurate understanding of the relationship between exposure to new infections and malaria prevalence or clinical incidence is needed to determine how accurately these surrogate markers represent heterogeneity in transmission at local scales. In addition, quantifying clinical incidence in relation to exposure to blood-stage infections can increase our insight into the development and maintenance of immunity to malaria in a setting of sustained malaria control (Battle et al., 2015; Cameron et al., 2015). The molecular force of blood-stage infection (molFOB) describes the number of new genotypes observed in consecutive blood samples from cohort participants over time (Mueller et al., 2012; Koepfli et al., 2013). Genotyping of highly polymorphic markers detects superinfecting parasite clones in asymptomatic (but parasitaemic) or symptomatic individuals. molFOB thus provides a longitudinal, individual and quantitative measure for exposure to new blood-stage malaria infections (Mueller et al., 2012; Koepfli et al., 2013). For P. falciparum, molFOB is closely linked to the number of infective mosquito bites and therefore is a direct proxy for the actual force of infection (FOI) and thus for transmission in endemic settings (Smith et al., 2010). For P. vivax, clones appearing in the blood-stream can either originate directly from an infective mosquito bite or from a relapsing liver hypnozoite (Koepfli et al., 2013). For P. vivax, molFOB is thus a compound measure of exposure to newly acquired infections from mosquito bites and relapsing blood-stage infections. The usefulness of molFOB as a surrogate marker of individual exposure was validated originally in a cohort of young PNG children 1–4 years of age, in which species-specific molFOB was the most important predictor of clinical incidence for both species (Mueller et al., 2012; Koepfli et al., 2013). Although some spatial heterogeneity of transmission was observed in that study for both species, due to the high level of transmission the species-specific difference in rate of immune acquisition was the predominant feature in that study. While P. vivax molFOB (Pv-molFOB) did not change with age, the incidence of P. vivax clinical episodes decreased significantly with age, with a faster rate of decrease in children with high Pv-molFOB . P. falciparum molFOB (Pf-molFOB) in that cohort was lower compared to Pv-molFOB and the incidence of P. falciparum clinical episodes increased in parallel with an increasing Pf-molFOB in children 1–3 years, reaching a plateau thereafter (Lin et al., 2010; Mueller et al., 2012). These earlier results indicated that (i) immunity to P. vivax is acquired more rapidly in children with higher cumulative exposure, that (ii) this developing immunity led to proportionally fewer clinical P. vivax episodes in older children despite similar exposure to new P. vivax blood-stage infections, and that (iii) higher exposure to P. vivax blood-stage infections, compared to P. falciparum, resulted in a more advanced immunity to P. vivax in this age group compared to P. falciparum (Doolan et al., 2009; Longley et al., 2016). The major challenge to these cross-species comparisons lies within the intrinsic differences of Pf- and Pv-molFOB: whereas Pf-molFOB is a direct marker of mosquito-borne transmission, Pv-molFOB is a composite measure reflecting both newly acquired infections and those caused by relapses of previously acquired infections. In this study, we extend the analysis of molFOB’s relationship with incidence of clinical malaria episodes to older PNG children and a lower transmission scenario. In addition, given the unique study design that randomized blood-stage only or blood- plus liver-stage treatment at enrolment (Robinson et al., 2015), we are now, for the first time, able to compare the incidence of newly acquired P. falciparum infections with both the incidence of newly acquired P. vivax infections and relapsing P. vivax infections. Advancing on previous studies that investigated each species individually (Mueller et al., 2012; Koepfli et al., 2013), we now provide a comparative analysis of P. falciparum and P. vivax, directly exploring the role of exposure to multiple Plasmodium species in the development of clinical immunity to P. falciparum and P. vivax malaria. We quantify in detail the extent of heterogeneity in molFOB on a small geographical scale and relate this to heterogeneity in clinical episode incidence to investigate effects of small-scale variation in malaria transmission on local malaria epidemiology. By combining in-depth molecular parasitological data with demographic and clinical data, this study thus provides detailed insights into the changing epidemiology of malaria in PNG in response to intense malaria control efforts. This study was conducted in six villages in Maprik district, East Sepik Province, PNG between August 2009 and May 2010 (Robinson et al., 2015). 524 children aged 5–10 years were enrolled and randomized to receive either chloroquine (CQ), artemeter-lumefantrine (AL) and primaquine (PQ); or CQ, AL and placebo. Demographic parameters of the 466 children that completed the full course of randomized treatment with PQ/CQ/AL (n = 233) or placebo/CQ/AL (n = 233), and were thereafter closely followed for 8 months, were comparable between the six villages (Table 1). Characteristics of study participants by village. * LLIN use in the night preceding enrolment. † Information on LLIN use in the previous night was collected at each follow-up visit and averaged across follow-up per participant. Mean LLIN use by village was calculated from the averaged individual LLIN use. P. vivax was the most common infection at enrolment with 48% of children positive by quantitative PCR (qPCR), followed by P. falciparum (24%), P. malariae (15%) and P. ovale (3%; Table 2). 39% of children were not infected with any Plasmodium species at enrolment. The vast majority of P. malariae (75%) and almost all P. ovale infections (93%) occurred in children co-infected with either P. vivax and/or P. falciparum (Table 2). Prevalence of each Plasmodium species varied between villages (P. falciparum, 9–71%; P. vivax, 38–67%; P. malariae, 8–40%; P. ovale, 0–11%; Table 2) and was highest in Bolumita for all species. Accordingly, mixed-species infections were also most prevalent in Bolumita (Table 2). The multiplicity of infection (MOI), that is, the number of parasite genotypes per infection, also varied between villages for both species (mean P. falciparum MOI, 1.1–2.2 clones/infection; mean P. vivax MOI, 1.6–2.9 clones/infection) and children from Bolumita carried more multi-clone infections with P. vivax and P. falciparum than children in other villages (Table 2). Mean P. falciparum parasite density was almost two- to six-fold higher in Bolumita (331 18S rRNA gene copies/µl) than in other villages (56–192 18S rRNA gene copies/µl, Table 2). Plasmodium infection status at enrolment by village. * % of infections by qPCR that are mixed-species infections. † Geometric mean of species-specific 18S rRNA copy numbers per µl blood. ‡ MOI, multiplicity of infection: number of Pf-msp2 and Pv-msp1F3 alleles per infection. § Differences between villages were tested for using Chi2 and Fisher’s exact test (prevalence, proportion mixed) or Kruskal-Wallis test (MOI, log10-transformed parasite density). Children who had received PQ for clearance of P. vivax hypnozoites experienced similar numbers of new blood-stage infections with P. falciparum and P. vivax during follow-up (mean Pf-molFOB = 1.5 CI95 [1.3–1.7] new blood-stage clones/year, Pv-molFOB = 1.6 [1.4–1.9] new blood-stage clones/year, Figure 1A, Figure 1—figure supplement 1). Pf-molFOB in the placebo arm was comparable to the PQ arm (mean Pf-molFOB = 1.4 [1.2–1.6] new blood-stage clones/year), whereas due to the hypnozoite reservoir Pv-molFOB was more than three times higher in the placebo arm compared to the PQ arm (mean Pv-molFOB = 5.4 [4.9–5.8] new blood-stage clones/year). Pv-molFOB in the placebo arm showed a pronounced peak at months 2–3 of follow-up, which likely represents a wave of fast-relapsing hypnozoites in children who did not receive PQ (Figure 1A). P. falciparum and P. vivax molFOB (A), prevalence by qPCR (B) and LM (C) by week of follow-up. Blue lines, P. falciparum; red lines, P. vivax; solid lines, placebo arm; dashed lines, PQ arm. Open circles in (B) mark enrolment qPCR prevalence for each species. 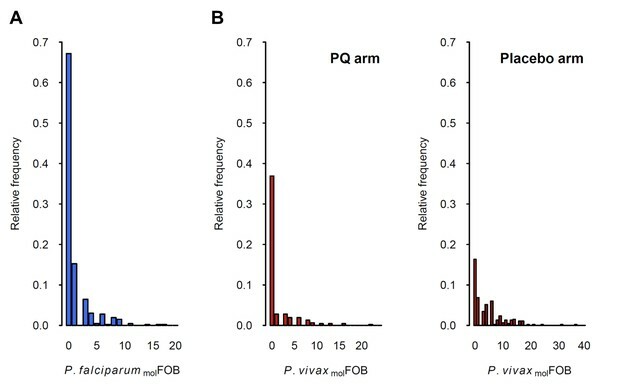 P. vivax prevalence in the PQ arm was comparable to P. falciparum prevalence throughout the study and increased steadily, irrespective of the diagnostic method used (Figure 1B and C). P. vivax prevalence increased more rapidly in the placebo arm until month 3 of follow-up and dropped thereafter, similar to patterns in Pv-molFOB in the same arm. Prevalence as measured by qPCR did not reach pre-treatment levels until the end of the study for any of the four Plasmodium species (Figure 1B, Figure 1—figure supplement 2). 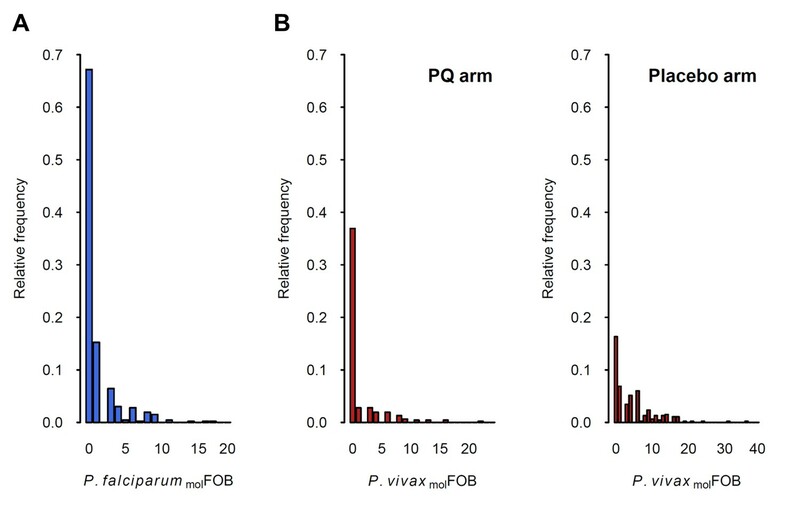 At the end of follow-up, P. vivax prevalence by qPCR in the placebo arm was 25% [19–31%], and therefore more than two-fold higher than in the PQ arm (9% [6–14%]; Figure 1B). Also, throughout follow-up, P. vivax prevalence in the placebo arm was 2–3 fold higher compared to the PQ arm, suggesting that at least 50% of the overall P. vivax prevalence in this cohort can be attributed to the contribution of relapses. Similarly, throughout and at the end of follow-up P. vivax prevalence in the placebo arm was 2–3 fold higher compared to P. falciparum (irrespective of treatment arm; P. falciparum prevalence at end of follow-up, 10% [8–14%]), which is in agreement with the prevalence pattern at enrolment. Assuming equal transmission from mosquitoes for both species, which was corroborated by a comparable Pf-molFOB and Pv-molFOB in the PQ arm, P. vivax relapses have contributed to a P. vivax prevalence twice as high as that of P. falciparum. In the present study design, recurrent blood-stage infection can either originate from a new transmission event (both arms and all species) or for P. vivax and P. ovale also from a relapse of any previous infection (placebo arm only). After adjusting for the effect of PQ treatment (Robinson et al., 2015), village of residence and infection status by qPCR at enrolment were the main predictors for the risk of recurrent Plasmodium spp. during follow-up (Table 3). Interestingly, in addition to a protective effect against recurrent P. vivax and P. ovale, the risk of recurrent P. falciparum was also reduced by 27% [0–48%] after PQ treatment (p=0.064). * AHRs were modeled using Cox proportional hazard regression. † Mixed infection including P. falciparum or P. vivax infection in conjunction with one or more other Plasmodium spp. PQ: Primaquine; LLIN: long-lasting insecticide-treated net; Hb: haemoglobin. The risk of a recurrent infection (measured by qPCR) with P. falciparum, P. vivax and P. ovale varied more than 7-fold between villages, with a higher risk observed in Bolumita (78%, 77%, and 15% with recurrent P. vivax, P. falciparum and P. ovale, respectively) compared to the other villages (recurrent P. vivax, range 25–73%; recurrent P. falciparum, range 12–44%; recurrent P. ovale, range 0–7%). For P. falciparum and P. vivax, a mixed infection at enrolment as measured by qPCR was further associated with up to a two-fold increased risk of recurrent infection (P. falciparum: AHR = 2.08 [1.25–3.48], p=0.005; P. vivax: AHR = 1.74 [1.14–2.65], p=0.010; Table 3), supporting the idea that focal transmission within villages leads to the presence of high-risk and low-risk individuals. For P. malariae, the infection status at enrolment was a stronger predictor of risk of recurrent infection than village of residence. An infection with P. falciparum, P. malariae or a mixed infection at enrolment as measured by qPCR was associated with up to a 6-fold increase in risk of recurrent P. malariae (AHRPf-enrol = 3.54 [0.85–14.72], p=0.083; AHRPm-enrol = 6.35 [1.31–30.81], p=0.022; AHRmixed = 3.37 [0.88–12.90], p=0.076; Table 3). Reported use of a LLIN during the night previous to enrolment was associated with a reduced risk of recurrent P. vivax and P. falciparum in univariate analyses (Supplementary file 1 - Table 1) but to a lesser extent in multivariable analyses (P. vivax: AHR = 0.62 [0.39–0.98], p=0.043, P. falciparum: AHR = 0.84 [0.49–144], p=0.531). Haemoglobin (Hb) level at enrolment was negatively associated with the risk of recurrent infection with P. vivax (AHR = 0.88 [0.80–0.98], p=0.019) and P. falciparum (AHR = 0.90 [0.80–1.02], p=0.099). Patterns in the risk of recurrent infections with P. falciparum and P. vivax as measured by light microscopy (LM, Supplementary file 2) were similar to those observed for re-infection as measured by qPCR. When based on LM observation (but not as measured by qPCR), increasing age was associated with a reduced risk of recurrent P. vivax (AHR = 0.85 [0.77–0.95], p=0.004; Supplementary file 2) but an increased risk of recurrent P. falciparum (AHR = 1.16 [1.01–1.33], p=0.037; Supplementary file 2). The incidence of new P. falciparum and P. vivax blood-stage clones detected during follow-up, that is molFOB, was highly variable between individual children and ranged from 0 to 18 new clones/year for P. falciparum (Figure 2A) and 0 to 36 or 23 new blood-stage clones/year for P. vivax in the placebo or PQ arm, respectively (Figure 2B). Mean Pf- and Pv-molFOB varied significantly between villages and were higher in Bolumita (Pf-molFOB = 4.9 new blood-stage clones/year, Pv-molFOBPQ arm=4.4 new blood-stage clones/year, Pv-molFOBplacebo arm=12.1 new blood-stage clones/year; Table 4; Figure 3) than in the other villages (Pf-molFOB, range 0.7–1.8 new blood-stage clones/year; Pv-molFOBPQ arm, range 0.03–2.2 new blood-stage clones/year; Pv-molFOBplacebo arm, range 2.3–7.4 new blood-stage clones/year). In univariate analyses, new P. vivax infections were strongly associated with new P. falciparum infections per sampling interval and vice versa, suggesting concurrent exposure to the two species (Supplementary file 1 – Table 2). However, these effects were reduced when other variables of varying exposure such as village of residence or infection at enrolment were included in the multivariable model (P. vivax: IRRPQ arm=1.32 [0.92–1.89], p=0.134; IRRPlacebo arm=1.10 [0.85–1.42], p=0.466; P. falciparum: IRR = 1.15 [0.97–1.36], p=0.100, Table 4). LLIN use, although strongly associated with lower Pf- and Pv-molFOB in univariate analyses (Supplementary file 1 – Table 2), remained significantly associated in multivariable models only for P. vivax in the placebo arm, where sleeping under a LLIN in the night previous to enrolment was associated with a 38% [9–57%] reduction in Pv-molFOB (p=0.013, Table 4). Each additional year of age was associated with a 14% [0–26%] reduction Pv-molFOB per sampling interval in the PQ arm (p=0.059), while no age effect was observed in the placebo arm or for P. falciparum (Table 4). Hb level at enrolment was negatively associated with Pf- and Pv-molFOB (P. vivax: IRRPQ arm=0.85 [0.72–1.01], p=0.063; IRRPlacebo arm=0.91 [0.85–0.99], p=0.025; P. falciparum: IRR = 0.85 [0.75–0.97], p=0.013), suggesting anaemia in individuals continuously exposed to blood-stage infections. Distribution of P.falciparum molFOB (A) and P. vivax molFOB by treatment arm (B). Relative frequencies among the 466 children are shown. Heterogeneity in molFOB (A, B) and clinical episode risk (C, D) of P.falciparum (A, C) and P. vivax (B, D). Upper panels show the kriging fit of model predictions of molFOB and clinical episode risk of children in both treatment arms. Lower panels show the standard error relative to the kriging estimate. Dots represent study participants’ houses and are color-coded according to village. Black lines: vehicle-accessible road; dark grey lines: vehicle-inaccessible road; light grey lines: river; red/white cross: health center or aid post; grey square: school or enrolment location. Maps were prepared using ArcGIS 10.2 (Esri, USA). Multivariable predictors of Pv- and Pf-molFOB per follow-up interval. Model predictions from this model were used for mapping molFOB in Figure 3A. New P. falc. infections in interval‡ 1.32 0.92–1.89 0.134 1.10 0.85–1.42 0.466 n.a. n.a. n.a. *IRRs were modeled per sampling interval using negative binomial generalized estimating equations allowing for repeated visits with log-link and an exchangeable correlation structure. ‡molFOB in the follow-up interval (time-varying covariate). A total of 98 clinical malaria episodes, here defined as fever plus presence of LM-detectable parasites, were observed during the study period. Of these, 64 (65%) exceeded the previously established pyrogenic thresholds of 2500 and 500 parasites/µl per LM for P. falciparum and P. vivax, respectively (Mueller et al., 2009b). P. falciparum was the most common cause of clinical malaria episodes (P. falciparum, 64 clinical episodes; P. vivax, 31 clinical episodes; mixed P. falciparum/P. vivax by LM, 3 clinical episodes), despite lower incidence of new P. falciparum blood-stage clones compared with P. vivax (P. falciparum, 342 new P. falciparum blood-stage clones; P. vivax, 849 new blood-stage clones). Including clinical episodes with mixed infection as determined by LM in the estimates for both species, clinical incidence rate (IR) was 0.28 [0.21–0.35] P. falciparum episodes/year and 0.12 [0.08–0.17] P. vivax episodes/year. At least one new blood-stage clone was detected in 70% (47/67) of samples from P. falciparum and 71% (24/34) of samples from P. vivax clinical episodes. Of these clinical episodes with new blood-stage clones, 96% (45/47) and 83% (20/24) carried only the new but no persistent P. falciparum and P. vivax clones, respectively. P. vivax clinical episodes occurred mainly in the placebo arm shortly after directly observed treatment (DOT) (Robinson et al., 2015), the time of peak Pv-molFOB due to relapsing hypnozoites (Figure 1A). On an individual level, Pv-molFOB was positively associated with the risk of clinical episodes and each additional blood-stage P. vivax clone increased the risk of experiencing a P. vivax clinical episode slightly (AHR = 1.07 [1.04–1.09], p<0.001; Table 5). No significant differences in P. vivax clinical episode risk were observed between villages after adjusting for individual molFOB. The risk for a P. vivax clinical episode decreased significantly with age (AHR = 0.62 [0.46–0.84], p=0.002; Table 5). This was paralleled by a decrease in P. vivax densities with age (by qPCR, exp(β)=0.90 [0.83–0.98], p=0.016; Supplementary file 3) indicative of more advanced immunity against P. vivax and thus better control of P. vivax densities in older children. Multivariable predictors for time to P. vivax and P. falciparum clinical episodes. Model predictions from this model were used for mapping the relative risk of clinical malaria episodes in Figure 3C and D.
P. vivax molFOB‡ 1.07 1.04–1.09 <0.001 n.a. n.a. n.a. * AHRs were modeled using multiple failure Cox proportional hazard regression. ‡ Average molFOB until the time of failure (time-varying covariate). Patterns in the occurrence of P. falciparum clinical episodes during follow-up were more complex. Between-village variation in P. falciparum clinical episode risk remained significant even after adjusting for individual exposure. This effect was mainly apparent in Numangu, where children were at three- to six-fold higher risk for clinical episodes than children in other villages (Numangu AHR = 4.29 [2.06–8.97], other villages range AHR = 0.65 [0.20–2.08] to 1.39 [0.59–3.30]; Table 5). Overall, Pv-molFOB was positively associated with the risk of clinical episodes and each additional P. falciparum blood-stage clone slightly increased the risk for P. falciparum clinical episodes (AHR = 1.15 [1.11–1.21], p<0.001; Table 5); however, relative to the number of new blood-stage clones, P. falciparum clinical episodes were less frequent in highly exposed children compared to low-exposed children (Figure 4). One clinical episode per three new blood-stage clones was detected in the least exposed children (Pf-molFOB <4 new blood-stage clones/year), but only one clinical episode per 15 blood-stage clones in the highest exposed children (Pf-molFOB >9 new blood-stage clones/year, Fisher’s exact test p<0.001). Age was not associated with the risk of P. falciparum clinical episodes. LLIN use at enrolment was associated with a 56% [13–78%] reduced risk of P. falciparum clinical episodes (p=0.018; Table 5). The incidence of P.falciparum (A) and P. vivax (B) clinical episodes relative to molFOB. Mean clinical episode incidence is shown as bars (left axis) and proportion of clinical episode incidence divided by molFOB as connected dots (right axis). Error bars represent 95% CIs. p-values refer to the differences between groups in the proportion of clinical episodes and new infections, assessed by Chi2 or Fisher’s exact test. A higher risk for P. falciparum clinical episodes in children that had received PQ treatment for clearance of P. vivax liver stages was observed (AHR = 1.79 [1.05–3.03], p=0.031; Table 5), suggesting a potential protective effect of P. vivax infections against P. falciparum clinical episodes. Analysis to further explore this revealed that a concurrent or recent infection (i.e., at the same or preceding follow-up visit) with P. vivax reduced the odds of a P. falciparum clinical episode by 65% [22-85%] (p=0.011; Table 6). Further indications for a potential interaction between the two species was also observed when analyzing P. falciparum parasite densities, which were reduced by 55% [19–75%] (p=0.008; Supplementary file 3) in mixed P. falciparum/P. vivax infections compared to P. falciparum single infections, indicative of suppression of one of the species in mixed infections. * ORs were modeled using a binomial generalized estimating equation with logit link function using an exchangeable correlation structure. † Determined as P. vivax positive at the same or previous sampling visit. In the present study, we describe striking heterogeneity in malaria transmission not only between closely neighboring communities in Maprik district, PNG, but also substantial differences in exposure between individual children from the same village. On village level this heterogeneity is apparent both when using traditional markers such as prevalence of infection, as well as when using the novel `reference standard` marker of individual exposure molFOB. The increased resolution provided by molFOB further allows quantifying heterogeneity in exposure to new blood-stage infections between individual children. Extending an earlier study in a neighboring area in which younger children had been enrolled, and that had identified molFOB as the most important predictor of malaria clinical episodes (Mueller et al., 2012; Koepfli et al., 2013), we confirmed that molFOB remains significantly associated with the risk for clinical episodes, but other factors such as age (P. vivax), or a mixed Pf/Pv infection and village factors not captured by any of the other parameters assessed (P. falciparum) have a stronger effect on the risk for clinical malaria (Table 5 and 6). Malaria transmission is often estimated by investigating the more accessible human host rather than the mosquito vector (Tusting et al., 2014). Because P. falciparum blood-stage infections are a direct outcome of mosquito-to-human transmission, infection parameters assessed in the human blood closely reflect P. falciparum transmission. In contrast, relapses arising from dormant hypnozoites contribute substantially to P. vivax blood-stage infections (Robinson et al., 2015), thus complicating the assessment of mosquito-to-human P. vivax transmission via infection parameters measured in the human blood. The unique design of this study, that combined clearance of hypnozoites in half of the study participants with subsequent measurement of Pv-molFOB, allowed us to identify the burden of P. vivax infections due to mosquito-to-human transmission (in hypnozoite-cleared individuals) and compare it to the total burden of P. vivax infections. We found a highly similar incidence and comparable temporal and spatial heterogeneity of P. falciparum and P. vivax infection acquired through renewed exposure to infected mosquito bites. In children that experienced the full burden of relapses we found two-fold higher P. vivax infection prevalence and 4-times higher incidence (molFOB) compared to P. falciparum. This first quantitative comparative assessment of P. falciparum and P. vivax transmission using non-entomological molecular parameters thus indicates that the observed differences in epidemiology between the two species are largely due to the high burden of relapsing P. vivax blood-stage infections (Robinson et al., 2015). Our molecular results thus support recent entomological data from Dreikikir district, 50 km from Maprik in East Sepik Province (Reimer et al., 2016) as well as earlier studies in East Sepik (Hii et al., 2001) that found similar sporozoite rates for P. falciparum and P. vivax. Our previous analysis of this cohort had investigated the contribution of the hypnozoite reservoir to P. vivax infection and disease in order to inform strategies for achieving a sustained reduction of the P. vivax burden in PNG (Robinson et al., 2015). Here, we now describe the post-treatment re-infection dynamics in higher temporal detail. Through a detailed comparison of these patterns for P. vivax and P. falciparum in PQ and placebo-treated children we further elucidate the contribution of relapses to P. vivax prevalence and clinical incidence, which are the most commonly used parameters for planning and monitoring of malaria control strategies. P. vivax relapses accounted for more than half of the observed P. vivax prevalence in this cohort, which is lower than what was previously estimated as the contribution of relapses towards Pv-molFOB by comparison of treatment arms (77%, Robinson et al., 2015). This difference can be accounted for by the higher number of P. vivax multiple clone infections that will accumulate more rapidly in the placebo-arm, where additional parasite clones from relapses and/or new infections may overlap with without a corresponding change in overall prevalence. While we previously described a sustained effect of PQ treatment with significant reductions in Pv-molFOB observed up to eight months post treatment (Robinson et al., 2015), here, we describe temporal variation in relapse rate with a rapid and wave-like recurrence of P. vivax in children from the placebo arm, who had retained their hypnozoites (Figure 1A). The concurrent, modest peaks in Pf-molFOB and Pv-molFOB in the PQ arm represent seasonal variation in transmission, which is highest in December and January in the study area (Mueller et al., 2012); corresponding to weeks 8–14 of follow-up). A much higher peak and subsequent drop in appearance of new clones within three months after blood-stage only treatment, which was mirrored by a corresponding peak and drop in P. vivax prevalence (Figure 1B andC), suggests that the incidence of relapse infections in the blood was not constant during follow-up. P. vivax infections are often observed following treatment of P. falciparum malaria (Douglas et al., 2011), and it can thus been hypothesized that the frequency of relapses may be temporarily increased after blood-stage antimalarial treatment (White and Imwong, 2012). It is thus conceivable that the blood-stage antimalarial at baseline either triggered P. vivax relapses directly, or indirectly by allowing more hypnozoites to establish blood-stage infections in parasite-free hosts. Alternatively, blood-stage P. vivax infections from hypnozoites relapsing shortly after baseline treatment (during a period when antimalarial drugs were present at sub-curative levels) may be suppressed to sub-detectable densities until complete waning of drug levels, resulting in simultaneous proliferation and detection of many new blood-stage clones within the first weeks after treatment (Douglas et al., 2011; Tarning et al., 2014). More detailed modeling of the dynamics of individual P. vivax blood-stage infections and their association with potential triggers such as treatment or febrile illness will be required to determine the existence and importance of proposed relapse-triggers. Malaria transmission showed high micro-spatial heterogeneity with more than 10-fold differences in Pf- and Pv-molFOB (in the PQ arm) between villages despite an overall high LLIN use by the study participants (during follow-up; village average use,>90%; individual use,>50%). Individual LLIN use at enrolment was nevertheless associated with a reduced risk of recurrent P. falciparum and P. vivax in univariate analyses. However, after adjustment for other related variables (i.e., village of residence or infection status) this association became non-significant. Children living in Bolumita, where both P. falciparum and P. vivax molFOB and prevalence were highest, had a modestly lower LLIN use (mean during follow-up, 92%; at enrolment, 77%) compared to children from other villages (mean during follow-up, 97–100%; at enrolment, 91–100%). It is conceivable that LLIN use in the Bolumita community may be less effective in reducing malaria transmission (Killeen et al., 2007; Smith et al., 2009). Potential differences between villages in mosquito density, behavior, sporozoite rate, proximity of house or play areas to mosquito breeding sites, or human behavioral factors (related to LLIN use or other risk factors) are however likely to be more important determinants for exposure to infective bites. Small-scale variations in vector species and distribution between and within villages in PNG have been described previously (Cattani et al., 1986; Reimer et al., 2016; Charlwood et al., 1986; Hii et al., 1997; Burkot et al., 1988) and likely account in a large part for the micro-geographic heterogeneity in malariological parameters observed in this and other studies. Assessing the incidence of new infections from consecutive blood samples using molecular methods (as is necessary to determine molFOB), is complicated by fluctuating densities of clonal parasitemia that may temporarily fall below the limit of detection of the genotyping PCR, leading to imperfect detectability of clones (Bretscher et al., 2010; Felger et al., 2012; Koepfli et al., 2011). For P. falciparum, periodical sequestration of clones and absence from the peripheral blood at time of sampling may further contribute to imperfect detectability. For P. vivax, generally low parasite densities aggravate the problem of imperfect detectability, and dis- and re-appearance of clones may be a result of imperfect detectability or relapsing hypnozoites. The overall estimates of molFOB presented here may thus be biased. Accurately assessing the effects of this imperfect detectability on parameters estimated from longitudinal genotyping data, such as molFOB, requires complex mathematical modeling (Bretscher et al., 2010; Felger et al., 2012; Sama et al., 2005; Sama et al., 2006). However, although clonal detectability has been shown to decrease with age (Felger et al., 2012; Sama et al., 2006) and MOI (Koepfli et al., 2011), it is unlikely to vary substantially within our cohort’s age range and transmission setting. Hence the observed differences in molFOB are likely to accurately reflect the relative differences in individual exposure as well as in population transmission levels within the study area. Evaluating the impact of malaria control efforts requires monitoring changes in malariological metrics over extended periods of time. Drawing comparisons between studies performed at different times in different age groups is particularly challenging because of the interplay of past and current exposure to infective bites and the resulting anti-malarial immunity in the study population of a certain age. In our cohort, fewer P. vivax clinical episodes than P. falciparum clinical episodes were detected despite a higher incidence of P. vivax blood-stage infections, which is consistent with earlier studies in children of similar age (Michon et al., 2007). The very low incidence of clinical P. vivax episodes in our cohort, at 0.16 clinical episodes/year (placebo arm [Robinson et al., 2015]), contrasts drastically with that of 2.46 P. vivax clinical episodes/year observed in an earlier observational cohort of younger children aged 1–4 years from the same area (Lin et al., 2010). The 3-fold difference in Pv-molFOB between the two cohorts seems modest when compared to the 15-fold difference in the incidence of clinical Pv episodes (Koepfli et al., 2013). This suggests that the much lower incidence of P. vivax clinical illness in 5–10 years old children of this study is more likely explained by an advanced state of immunity to P. vivax compared to the younger children of the earlier cohort than the drop in P. vivax transmission. Consistently, age emerged as the strongest factor associated with protection against P. vivax clinical episodes, Pv-molFOB and P. vivax parasite density. Like in the previous cohort of younger children from neighboring villages (Lin et al., 2010) the incidence clinical P. vivax clinical episodes dropped significantly with age. Unlike in the previous cohort of younger children (Koepfli et al., 2013), in this cohort we additionally observed a drop in Pv-molFOB as well as P. vivax densities with age (Table 4 and Supplementary file 3). This is a further indication of the substantial clinical immunity to P. vivax acquired during years of past exposure in the children of this study, which is still ongoing after the age of five. In sharp contrast to the age-dependent decline of P. vivax clinical episode incidence, no age-dependent decrease in the incidence of clinical episodes was observed for P. falciparum. In a previous cohort study conducted in 2004 in 5–14 year old children in an area from PNG with substantially higher transmission levels (mean incidence risk 5.0 versus 0.8 infections/year, Michon et al., 2007; Robinson et al., 2015), the risk of moderate- to high-density P. falciparum infections decreased significantly with age (Michon et al., 2007). Clinical immunity to P. falciparum in children of this earlier cohort was not only significantly further advanced compared to children of this cohort, but in addition, transmission was more homogeneous in the area of that study. As a consequence age was a much better marker of life-time exposure and thus immune status compared to the present cohort. In this cohort, exposure to P. falciparum infections was highly heterogeneous between study participants. Mathematical modeling suggests that at heterogeneous transmission, changes of parasite prevalence and clinical episode incidence with age are less pronounced compared to settings with homogeneous transmission (Ross and Smith, 2010). Although no age trends were observed for P. falciparum in this cohort, when children were stratified into groups ranging from low to high exposure we found that the proportion of P. falciparum clinical episodes relative to new infections decreased with increasing exposure. This could either reflect the development of clinical immunity in highly exposed children, or premunition, a proposed mechanism by which established infections help to control superinfections by immunological cross-protection (Sergent and Parrot, 1935; Smith et al., 1999). In settings of decreasing and heterogeneous transmission, age alone may therefore not be a suitable marker of immunity to P. falciparum. Instead, combining age and molFOB to estimate cumulative life-time exposure may provide a more accurate surrogate measure of the extent of acquired clinical immunity. With P. falciparum transmission declining in PNG due to successful malaria control strategies (Koepfli et al., 2015), it is conceivable that immunity against P. falciparum will develop more slowly, shifting the burden of disease towards older age groups or towards more complex, non-linear age patterns. This delay in immune acquisition is however more than compensated by the overall much lower incidence of clinical malaria clinical episodes: in cohort studies in children younger than 4 years from Maprik district, clinical P. falciparum incidence had dropped from 2.56 clinical episodes/year before (observational cohort, [Lin et al., 2010; Mueller et al., 2012]) to 0.67 clinical episodes/year immediately after the free LLIN distribution campaign (placebo arm, [Betuela et al., 2012]). Finally, given that four Plasmodium species co-exist in PNG, there has long been considerable interest in potential mechanisms of cross-species immunity and mixed species interactions (Mueller et al., 2009a; Bruce et al., 2000; Smith et al., 2001; Mehlotra et al., 2000). However, there is so far no consistent evidence for the presence or absence of cross-protection among Plasmodium species. P. vivax and P. falciparum infections in our study were concentrated in the same children and villages (Figure 3), likely due to overlapping focal transmission for P. falciparum and P. vivax and thus potentially high co-infection rates in mosquitoes. Contrary to an earlier cohort in younger PNG children that found a decreased risk of P. falciparum clinical episodes after PQ radical cure (Betuela et al., 2012), we found indications for an increased risk of P. falciparum illness after clearance of P. vivax hypnozoites using PQ. Our data suggests that in individuals with substantial clinical immunity against P. vivax, a concurrent P. vivax infection may provide protection against P. falciparum clinical episodes by limiting P. falciparum densities (Table 6, Supplementary file 3). However, the comparably small number of clinical episodes in this and the earlier contrasting study does not allow an in-depth analysis of causal relationships and therefore does not allow firm conclusions on the potential effects and mechanisms of cross-species interactions in mixed infections. In conclusion, this study provides detailed insight into the changing epidemiology of malaria in PNG children under sustained malaria control, by using molFOB as a powerful measure to quantitatively investigate patterns of new mosquito-derived P. falciparum and P. vivax infections versus those for P. vivax relapsing infections, as well as spatial and age trends in exposure to these infections. Striking heterogeneity in malaria transmission between villages as well as in individual exposure to new P. falciparum and P. vivax infections persisted in our study area despite very high use of LLINs. This presents a significant challenge for on-going malaria control efforts. The comparable patterns of new mosquito-derived P. falciparum and P. vivax infections indicate that sustained use of LLINs does result in a comparable reduction in transmission of both species. The higher incidence and prevalence of P. vivax infections observed in our data is thus directly linked to its ability to cause relapsing infections, highlighting the crucial role of hypnozoites for P. vivax epidemiology and the need to effectively intervene against these hidden stages. Together, these insights provide a crucial link to evaluate the level of P. vivax mosquito-based transmission against that of P. falciparum and serve to calibrate other standard malaria indicators such as parasite prevalence or incidence of clinical episodes and to ultimately inform new approaches to surveillance and response systems. This study was conducted in six villages in the Albinama and Balif areas, Maprik district, East Sepik Province, PNG between August 2009 and May 2010. The area is serviced by the Albinama health sub-center, Balif aid post and a network of health workers in all study villages. The study design has been described in detail elsewhere (Robinson et al., 2015). Briefly, 524 children aged 5–10 years whose parents provided written informed consent for their participation were enrolled and randomized to receive either chloroquine (CQ, days 1–3, total dose 25 mg/kg), artemeter-lumefantrine (Coartem, AL, days 11–13, 2 mg/kg A, 12 mg/kg L) and primaquine (PQ, days 1–20, 0.5 mg/kg/day); or CQ (days 1–3), AL (days 11–13), and placebo (days 1–20) over 20 days of directly observed treatment (DOT1-20) in a double-blinded manner. Children were actively visited and examined for signs and symptoms of malaria fortnightly at their schools for 8 months. In addition, passive surveillance was provided by the local health centre, aid post and village health workers throughout the study period. Finger-prick blood samples (250 µl) were collected at fortnightly active-follow-up visits in the first 12 weeks and monthly thereafter, as well as from symptomatic children detected during active or passive morbidity surveillance. Symptomatic children were tested for malaria infection with rapid diagnostic test (RDT, CareStartMalaria pLDH/HRP2 Combo, AccessBio, USA), and only RDT and or LM-confirmed Plasmodium infections of any density were treated with a 3 day course of AL. Household, village and health facility location data was collected using a handheld GPS receiver (Garmin GPSmap62sc) and maps were prepared using ArcGIS 10.2 (Esri, USA). The study received ethical clearance from the PNG IMR Institutional Review Board (0908), the PNG Medical Advisory Committee (09.11), the Ethics Committee of Basel 237/11 and was conducted in full concordance with the Declaration of Helsinki. The study was registered on ClinicalTrials.gov (NCT02143934). All blood samples were examined by LM and qPCR for detection and speciation of Plasmodium infections as described earlier (Robinson et al., 2015). Each blood slide was read independently by two skilled microscopists and re-read by an expert microscopist in case of discrepancies in positivity, speciation or density (≥2 x log10 difference). Thick blood films were examined by LM for 200 fields (1000x magnification) before being declared parasite-negative. Parasite density was converted from the number of parasites per 200–500 white blood cells (WBC) to parasites/µl assuming 8000 WBC/µl (WHO malaria microscopy training guide) and calculated as the geometric mean of all positive reads. DNA was extracted from the red blood cell pellet using the FavorPrep 96-well genomic DNA extraction kit (Favorgen). Samples carrying any Plasmodium spp. infection were identified using a generic qPCR (Wampfler et al., 2013) and positives were subsequently tested in species-specific qPCRs (Rosanas-Urgell et al., 2010; Wampfler et al., 2013). All qPCRs targeted the small subunit (18S) ribosomal RNA gene and were performed as simplex (P. vivax and P. falciparum) or duplex qPCR (P. malariae, P. ovale). The concentration of target copies per µl of DNA was determined relative to a dilution row of standard plasmid as previously described (Rosanas-Urgell et al., 2010). The qPCR limit of detection (LOD) was determined using a standard plasmid dilution row and defined as the last point with more than 50% of replicates positive. The LOD was 2 target copies/µl DNA, equaling 4 target copies/reaction, for all qPCRs. All samples that crossed the fluorescence threshold were scored as positive for species-specific qPCRs. In all samples positive in P. falciparum and/or P. vivax qPCRs, individual parasite clones were distinguished by genotyping the length-polymorphic Pf-msp2 or Pv-msp1F3 marker genes using capillary electrophoresis for highly precise fragment sizing (Koepfli et al., 2013; Koepfli et al., 2011; Falk et al., 2006; Schoepflin et al., 2009). MOI was determined by counting the number of detected Pf-msp2 or Pv-msp1F3 alleles per sample. molFOB was calculated from the number of new parasite clones detected per child or per sampling interval in the peripheral blood, divided by the individual time at risk or length of the interval. A new infection was defined as a Pf-msp2 or Pv-msp1F3 allele not present in the two preceding genotyping-positive samples collected during active or passive surveillance (Figure 1—figure supplement 1). Imperfect diagnostic detectability was not further adjusted for. Children were considered at risk for clinical malaria clinical episodes until the end of the study or until they were censored (on the last visit before two consecutively missed scheduled follow-up visits [Robinson et al., 2015]). For clinical endpoints, time-at-risk (TAR) was not further adjusted for interim missed follow-up visits because the intense active and passive case detection presumably led to detection of all malaria clinical episodes. In contrast, TAR for analysis of molecular data (e.g., molFOB) was reduced by the duration of the missed interval if a child was not seen by the study team for six weeks or more (≥42 days). Children with a TAR of less than 3 months (<84 days) were excluded. This resulted in an analyzed population of 466 children (characterized in Table 1) of which 430 (92.3%) completed the whole follow-up period, with a median of 15 (IQR: 13–17) study contacts and mean TAR of 186 days (IQR 168–223 days). Time to first Plasmodium infection by qPCR and LM and its association with covariates were modeled using Cox regression, and the proportional hazards assumption was checked using the test based on the Schoenfeld residuals. Multiple failure Cox regression was used to model the time to P. vivax and P. falciparum clinical episodes. For statistical analysis, a malaria clinical episode was defined as fever (>37.5°C axillary) plus the presence of LM-detectable parasites, irrespective of RDT result or antimalarial treatment during the field visit. Negative binomial generalized estimating equations (GEE) with log link function using an exchangeable correlation structure were used to model incidence of new infections with P. falciparum and P. vivax per sampling interval. For these analyses, the time at risk was restricted to the intervals where molFOB could be estimated (i.e., starting in the third follow-up interval). A binomial GEE with logit link function using an exchangeable correlation structure was used to model the odds of a P. falciparum clinical episode per interval. Gaussian GEEs with log link function using an exchangeable correlation matrix were used to model log-transformed qPCR parasite densities in qPCR-positive samples, measured as 18S rRNA copy numbers/µl blood. In the GEE and Cox models where molFOB was a covariate, it was included as a time-varying covariate. When modelling molFOB (Table 4) and the odds of clinical episodes (Table 6) using GEEs, molFOB was calculated for each follow-up interval and used as predictor. In Cox models investigating the risk of clinical episodes (Table 5), molFOB was calculated based on the new infections up to the time of failure and used as predictor. In exploratory preliminary analyses we tested for a wide variety of interactions between covariates including interactions between all combinations of molFOB, enrolment infection status, age, village and bednet-usage. All analyses were done using STATA v14 and R.
Maps were drawn using Arcgis 10.1 (Esri Inc.). Ordinary kriging was used to generate the contour maps. Semivariograms were used as the mathematical forms used to express autocorrelation. Input variables for the spatial models were (i)molFOB (prediction of independent variable, molFOB) using the model presented in Table 4 (negative binomial GEE) for Pf and Supplementary file 4 for Pv (same as that shown in Table 4 but with primaquine and placebo arms combined), resulting in Figure 3 Panels A and B; (ii) relative risk of clinical episodes as predicted by the model shown in Table 5, resulting in Panels C and D of Figure 3. Relative standard error maps were generated by dividing the absolute standard error map by the model prediction map. The Journal of Infectious Diseases 206:1771–1780. The American Journal of Tropical Medicine and Hygiene 39:135–144. Papua and New Guinea medical journal 29:11–17. Papua and New Guinea Medical Journal 29:19–26. The American Journal of Tropical Medicine and Hygiene 74:944–950. Annals of Tropical Medicine & Parasitology 89:359–376. Tropical Medicine & International Health 20:1745–1755. Journal of Medical Entomology 34:193–205. Transactions of the Royal Society of Tropical Medicine and Hygiene 95:7–13. The American Journal of Tropical Medicine and Hygiene 62:225–231. The American Journal of Tropical Medicine and Hygiene 76:997–1008. Arch Inst Pasteur Algér 23:279–319. Transactions of the Royal Society of Tropical Medicine and Hygiene 93:59–64. The American Journal of Tropical Medicine and Hygiene 64:262–267. CPT Pharmacometrics Syst. Pharmacol. 3:e132. Thank you for submitting your article "The complex relationship of exposure to new Plasmodium infections and incidence of clinical malaria in Papua New Guinea" for consideration by eLife. Your article has been reviewed by three peer reviewers, and the evaluation has been overseen by a Reviewing Editor and Prabhat Jha as the Senior Editor. The reviewers have opted to remain anonymous. This paper presents results of a cohort study in Papua New Guinea where 524 children from six villages were randomised to either chloroquine, artemeter-lumefantrine and placebo (which aims to clear Plasmodium parasites from the blood) or to chloroquine, artemeter-lumefantrine and primaquine (which aims to clear Plasmodium parasites from the blood and P. vivax hypnozoites from the liver). Individuals were followed-up for eight months for signs and symptoms of malaria. Repeated blood samples were taken and used to determine the molecular force of blood-stage infection, a proxy measure for malaria transmission and exposure. In the primaquine arm (blood- plus liver-stage treatment), the force of molecular bloodstream infection for P. vivax and P. falciparum was similar, but both varied substantially between villages and individuals (ranging from 0-23 and 0-18 new clones/year). A higher force of molecular bloodstream infection was seen for P. vivax in the blood-stage only arm (0-36 new clones/yr), presumably as a result of relapsing hypnozoites in the liver. Comparison of P. vivax prevalence during follow-up between the two study arms indicated that at least 50% of the P. vivax prevalence resulted from such relapses. Clinical episodes were more commonly caused by P. falciparum than by P. vivax despite a lower incidence of new clones in the blood. Increasing age was associated with reduced risk of clinical episodes with P. vivax and a concurrent or recent infection with P. vivax was associated with a reduced risk of a clinical episode with P. falciparum. All the comments made in the reviews listed below should be addressed. In addition, following the reviewer consultation session, it was felt that authors should try to make the key advance of this work clearer. In particular, there should be a clear agenda articulated in the Introduction, including how this differs from the primary analysis which has already been published. Also, make clear in the Abstract the cohort you are analysing. It was also noted that an a priori statistical analytical plan would have added a lot of credibility to the analysis and its conclusions, and the presence or absence of such a plan should be noted. This study followed a cohort of children in Papua New Guinea intensively to detect new infections by Plasmodium falciparum and P. vivax in the blood and to measure incidence of clinical disease caused by these parasites. These children had been initially cleared of blood stage malaria infection and sometimes also liver-stage P. vivax. This is a rich dataset and a fascinating study and analysis which provides many important insights into the epidemiology of malaria and how the species interact. The manuscript is well written. The analysis and interpretation of such a complex dataset is generally excellent, though I do not agree with every aspect – see below for more detailed comments. In particular, measuring the incidence of new infections by molecular methods is difficult because parasite densities often fluctuate below and above the detection limits of these methods (as previously shown by some of the same authors Koepfli, C., S. Schoepflin, M. Bretscher, E. Lin, B. Kiniboro, P. A. Zimmerman, P. Siba, T. A. Smith, I. Mueller and I. Felger (2011). "How much remains undetected? Probability of molecular detection of human Plasmodia in the field." PLoS One 6(4): e19010.) Thus the methods used by the authors could potentially overestimate the molecular force of infection, since infections which appear new are actually older ones with increased parasite density. This would influence the rest of the results. It is difficult to overcome this problem but it should be covered in more detail in the Discussion. The data are interesting and rich. The data set is unique – I am unaware of any other site with detailed molecular monitoring of Pv and Pf in a cohort studied in this way. My major reservation with this particular analysis is that there isn't a clear advance articulated. The Abstract ends with results, and doesn't present a short description of what the most important conclusion is. The Discussion is reasonably detailed but didn't guide me to a clear advance. The impact of hypnozoites on Pv risk has been described by previous work from the group on the impact of PQ in the randomized trial, the utility of molFOB has been described in previous work, and spatial heterogeneity is described in detail elsewhere. The link between asymptomatic acquisition of clones and febrile episodes is an important area to study, and showing links between the genotype of a febrile episode and the genotype of asymptomatic disease would have been interesting but these data are not presented. Hofmann and colleagues present a very interesting analysis from a cohort of children in PNG with in depth molecular analysis undertaken on blood samples collected every 14 days. The combination of dense sampling and 4 treatment arms with and without prolonged Pq radical cure, allows a unique opportunity to tease out the contributing factors of relapse and reinfection. The primary output of this study has already been published (Robinson et al. Plos Med 2015). In the current analysis the authors address the factors associated with greater risk of new infections and clinical episodes during follow up. 1) The Robinson et al. paper is an excellent presentation of the primary analysis of this cohort containing many of the parameters included here. It would be good state clearly how the current analysis differs from this and the additional information it provides. The Abstract also ought to include the dates of the original study to make it clear to those reading the Abstract alone that this is the same core data as that presented previously. 2) The analysis is complex including multiple factors such as different diagnoses (LM and qPCR), clinical and asymptomatic infection, 4 species of infection, two schizontocidal treatments (AL and Cq), two radical cure arms (Pq and placebo), time to event (survival/Cox Regression) and incidence (generalized estimating equations). Multivariable analysis are presented, but the univariable analyses behind these models are mostly omitted. I believe the analysis was well conducted and appropriate but as a reviewer I was challenged to see how these multiple multivariable models were constructed. For instance Table 3 and 5 are Cox regression models and yet HR are stated – surely these are Adjusted Hazards Ratios (AHR)? Gaps in the tables suggest that these components weren't included in the final model, but no information is given of univariable factors underlying this and how these changed after controlling for other factors. Since these tables include four species it could be hard to bring in all the data, but supplementary tables to highlight all the factors would be welcome. 3) The multivariable models are also confounded by likely interactions in the terms. For instance, in Table 3 the Infection status at enrolment was correlated with the Village. Was an interactive term needed to address this? 4) In subsection “Risk of re-infection and molFOB during follow-up”. The term "reinfection" was confusing. In the Pq treatment arms, if one assumes complete clearance of the hypnozoite stages, then any recurrent parasitaemia might be expected to be reinfection. But otherwise recurrent parasitaemias could also be P.vivax relapses. It's not clear whether the analysis is just selecting the Pq arms and these are really reinfections or whether the authors should be calling this section Risk of Recurrent infection (which I believe is the correct term). 5) In subsection “Risk of re-infection and molFOB during follow-up”. The haemoglobin concentration and variation with sustained and recurrent infection is very interesting (and adds another layer of complexity). But it appears that the parameter stated in the final sentence and again in Table 4, is the Hb on enrolment. Or is this at other times during the follow up. A full analysis of the Hb changes over time (if taken) would be fascinating but I presume that may be another paper to come. 6) Discussion paragraph five. The authors suggest that Pv infection is greater after Pf. Interesting Table 4 suggest that new Pf increases the risk of Pv in the PQ arm (which should have no hypnozoites left) but not in the placebo arm (or implied by the gap in the table). But in Table 3, initial Pf had no effect on risk of Pv. The latter were asymptomatic infections and it is the fever associated with the Pf parasitaemia rather than the parasitaemia itself that is hypothesised to awaken the hypnzoites. Did the authors look at Pv FOB after febrile clinical episodes and whether this differed between the Pq and non Pq arms? Thank you for resubmitting your work entitled "The complex relationship of exposure to new Plasmodium infections and incidence of clinical malaria in Papua New Guinea" for further consideration at eLife. Your revised article has been favorably evaluated by Prabhat Jha (Senior editor) and two reviewers, one of whom is a member of our Board of Reviewing Editors. 1) Time-varying exposures should be accounted for with time-varying covariates in the Cox model (as pointed out in the reviews of the original submission). This problem has not been adequately addressed. 2) Following consultation, the reviewers think the map (which is, apparently, for "illustrative purposes" rather than providing meaningful numerical estimates) should be moved to supplementary material (as a supplement to a primary figure, per journal policy) as this is not an essential part of the paper. The Kriging approach seems preferable to IDW for this. 3) eLife reporting guidelines state "Report exact p-values wherever possible alongside the summary statistics and 95% confidence intervals. These should be reported for all key questions and not only when the p-value is less than 0.05. " There are several places where this has not currently been done. Also, the current reporting and interpretation of p-values (dichotomising into significant/non-significant based on a.05 threshold) is inappropriate and inconsistent the recent ASA statement (http://dx.doi.org/10.1080/00031305.2016.1154108) which calls for a more nuanced interpretation. 4) There seems to be no justification for emphasising models based on stepwise variable selection. Such stepwise procedures are known to cause distortion and in this case appear unnecessary. The full models (currently reported in the supplementary material) should be reported instead. The authors have brought out a clear focus in the Abstract and Discussion, dealing with my previous major concern, and have in addition dealt with all my minor concerns extremely thoroughly. The data are unique, the analysis is clear and insightful, and I would support publication. On the minor point of kriging vs distance weighted interpolation the authors have presented a convincing case that it doesn't matter and I'm happy for whichever plot they feel most appropriate to be used – but it would be useful to include the other plot as supplementary material. 1) Reviewer 2 raised the point that time varying exposures should be modeled using time varying covariates in Cox models. This is clearly correct, and biases that arise when this is not done have been well documented. The authors' response to this was that "this was done because that variable can be estimated more reliably and shows less variation. In addition, there is also less risk of an auto-correlation with the outcome variable." I don't think this response is adequate for the following reasons. First, it is not clear what is meant by "auto-correlation with the outcome variable". Auto correlation is correlation of a variable with lagged version of itself as the name suggests. Second, it is not clear what they mean by "shows less variation" or why this should be important. Less variation between individuals? Why should that be a consideration? Third, and most importantly, by including a covariate representing the mean molFOB over the entire follow-up period the model is effectively saying that the risk of clinical malaria at any particular point of time depends on events that occur in the future. This is not consistent with what we know about how time works and is, in my opinion, indefensible. These problems can all be resolved by using a time varying covariates as reviewer 2 suggests. This is not difficult. 2) Reviewer 2 made another point about maps and the fact that the inverse distance weighted interpolation (IDW) method used by ArcGIS is not an appropriate method. This looks right to me, and the authors essentially agreed to this in their rebuttal letter but said: i) "It had not been our intention to conduct spatial risk mapping and therefore we had not used a model- based approach such as Kriging"; ii) a Kriging approached has now been used and results are similar to the IDW method; iii) "Considering the similarity between our original figure and the estimates obtained by the Kriging approach suggested by reviewer 2, we feel that IDW approach is sufficient to make this illustrative point and have thus kept the original figure in the revised manuscript file. They added that "It should be noted that this is not a modelling method and the contours on the maps are for illustrative purposes rather than prediction or extrapolation." My view on this is that contours are likely to misinterpreted as extrapolations (people will look at the pictures and forget the caveats), and if the results cannot be justified they shouldn't be in the paper. I am not clear what "for illustrative purposes" means. What is it illustrating? In my view the authors should just either show the raw spatial data, or present results of a model they can justify. i) The authors repeatedly use the word "significant", without qualification, to dichotomise the interpretation of results depending on whether p-values are <0.05 or otherwise. This can only really be justified by the fact that it is common practice (which is not actually a justification at all), and it is certainly not in line with mainstream statistical thinking (see, for example, Ch 9 of Kirkwood & Sterne's Essential Medical Statistics 2nd Edition and the ASA's recent consensus statement on p-values http://amstat.tandfonline.com/doi/abs/10.1080/00031305.2016.1154108). Since arbitrarily small differences of no clinical significance will give arbitrarily small p-values with enough data, it is clearly more important to focus on effect sizes and associated CIs. However, in the current manuscript reporting is inconsistent: sometimes only point estimates and p-values are given (eg. Paragraph two of subsection “Patterns in the risk of P. vivax and P. falciparum clinical episodes”) while elsewhere CIs and p-values are reported. In my opinion it is essential to report CIs associated with point estimates, and p-values may be reported optionally. ii) The use of stepwise variable selection procedures is known to cause problems (p-values will be too small, effect sizes too large – see, for example, Chapter 29 of Kirkwood & Sterne). It is also near universal advice to include covariates in a model where there are good a priori reasons for thinking they are likely to be important, regardless of what the p-values are. When you have enough data to include all these covariates there is no good reason for taking out variables because they fail to meet an arbitrary threshold of statistical significance (the fact that this is commonly done is not a good reason), and many good reasons not to. This problem can be easily fixed by reporting the full models (currently in the supplementary material) for Tables 3, 4 and 5. I don't see any value in reporting the models with the automated variable selection, though the univariate models in the supplementary material are useful. We have rewritten the Abstract and key components of the Introduction and Discussion to ensure that these points are clear and that the key advance of this work is more clearly articulated. An analytical plan focusses predominantly of the primary objectives of the trial – i.e. estimating the contribution of hypnozoites to the burden of infection, diseases and transmission – and has been included into the original trial protocol. This protocol has been registered on clinicaltrials.gov (NCT02143934) and is available upon request. The analyses presented in this manuscript represents a more complex epidemiological analysis of secondary aims and additional endpoints of this study that were not covered in the initial analyses plan. Imperfect detectability of individual genotypes complicates measuring the incidence of new infections and indeed makes it difficult to exactly estimate the number of genetically distinct infections an individual acquires. As a consequence – and as outlined in both Mueller et al. PNAS, 2012 and Koepfli et al. PLoS NTD, 2013, molFOB is a proxy rather than a direct measure of exposure. Whether molFOB over- or under-estimates the true number of newly acquired infections is dependent not only on the detectability of individual clones, but also on the mean duration (relative to sampling frequency) of an individual blood-stage infection. Generally, short infection durations will lead to an underestimation of the true incidence of infection, i.e. many infections will not be detected at all. Long durations may result in an over-estimation of the true incidence of infection, although we partially account for this by classifying a re-occurrence of the same clone as a new infection only when not detected in two preceding samples, opposed to a continuing infection (undetected for <2 immediately preceding samples). Importantly for the results presented in our current manuscript, molFOB (although a proxy measure of the true number of infections acquired by an individual) is relatively unbiased in regards to the most important variables influencing the risk of acquiring new infections such a season, age or the use of malaria control interventions. molFOB is therefore an unbiased estimate of difference in exposure between different individuals in the same cohort. Hence, even if we cannot exactly quantify the difference between the true incidence of new infection and its proxy measure, molFOB, this difference will not affect our ability to correctly estimate the effects of other variables on exposure and/or transmission. We have now included a paragraph in the Discussion addressing the issue of imperfect detectability and its relevance for the results presented here. According to the panel of reviewer’s recommendations we have now re-written the Abstract and parts of the Discussion to emphasize the novelty of the present manuscript, which consists in – for the first time – bringing together all of the above three subjects in one comprehensive, in-depth analysis. In particular, this is the first time that molFOB for P. falciparum and P. vivax has been assessed and compared in a cohort of children where we were able to selectively remove the contribution of P. vivax relapsing infections from half of the children. The fact that we can directly compare patterns of P. falciparum and P. vivax new mosquito-derived infections versus the patterns observed from P. vivax relapse represents a clear advance upon previous work. For better guidance of reader, we have added a paragraph to the Introduction outlining how this manuscript advances on the results from each preceding paper. We revisit this structure in the Discussion section, where we refer to each of the key papers published previously and reflect on how our detailed molecular genotyping on samples combined with a novel treatment study design contributes to an in-depth understanding of malaria epidemiology in PNG and in general. This was also pointed out by reviewer 1. As stated above, we agree with the reviewers that it would be most interesting to investigate in more detail the links between genotypes of febrile episodes versus asymptomatic infections in this dataset. We have now included data on the proportion of episodes that carry new infections in the Results section. An in-depth analysis of clonal patterns in clinical versus purely asymptomatic infections requires additional parasite genotyping and presents a highly complex analysis. We therefore feel that is beyond the scope of a revision for this manuscript. This point has been jointly raised by all reviewers, and we have rewritten the Abstract, as well as parts of the Introduction and Discussion in order to clarify how this manuscript advances over the Robinson et al. paper as well as other previous papers investigating molFOB in PNG children. All model estimates are given as adjusted hazard ratios (AHR), which we have now clarified in the tables. As stated in the Materials and methods section, for each analysis the most parsimonious model was generated from a full model by back-selection. We have now included supplementary tables with all full models. These complement the back-selected models presented in the main paper to allow a better evaluation of model results. Given the basic design of the trial and the strong effect of the randomized PQ treatment on the P. vivax burden, we feel it would be inappropriate to present results of P. vivax ‘univariate’ analyses that are not adjusted for the PQ treatment effect. Although the treatment does not affect the P. falciparum burden in the same way, we also adjusted analyses of potential risk factors for P. falciparum infection and disease for PQ treatment in ‘univariate’ analyses. These treatment-only adjusted HRs, rather than purely univariate factors, for each of the variables are now presented in an additional supplementary table for each main table. No. We tested extensively for interactions and are confident that we have explored potential confounding factors in sufficient detail in our preliminary analyses. Given the large amount of data in the manuscript, we only present the final, most parsimonious models and their results. We have now added a sentence to the statistical methods section highlighting that we did test for interactions in preliminary analyses and no significant interactions were found. We agree with the reviewer and have updated this throughout the manuscript, now referring to recurrent infections or risk of recurrent infection. Table 4 investigates parameters associated with the incidence of new clones per follow-up sampling interval, i.e. the detection of a new clone since the preceding sampling visit. In this model, haemoglobin concentration is included as the haemoglobin concentration at the end of the sampling interval; i.e. our data show that a reduced heamoglobin level at a next sampling visit is associated with a newly acquired P. falciparum infections in the preceding interval. This is suggestive of an in highly exposed individuals; however, no longitudinal analysis of changing haemoglobin levels during follow-up was performed. We are indeed planning much more detailed analyses of Hb changes over time and their relationship with Plasmodium infections using data from this and some of our other cohorts. Results from these analyses will be presented elsewhere. As stated above, Table 4 investigates parameters associated with the incidence of new clones during follow-up per follow-up interval, while Table 3 investigates predictors of the time-to-reinfection with P. vivax. In both tables, infections are included irrespective of whether they were symptomatic or asymptomatic at time of sampling. From Table 4 we conclude that a new infection with P. falciparum is associated with a new infection with P. vivax in the same follow-up intervalin the PQ arm, where the vast majority of new P. vivax infections originate from mosquito bites. Here, both species are potentially transmitted within one single infective bite or by several mosquito bites in heavily exposed children. This association is absent in the placebo arm, where most P. vivax infections originate from relapsing hypnozoites and only proportionally few new blood-stage infections are associated with an infective bite. We did not specifically investigate P. vivaxmolFOB after febrile episodes in this analysis; however, a novel mathematical modeling approach applied to data from this cohort and data from other P. vivax-endemic countries has shown that there is no observable association between relapses and fevers (White et al., manuscript under review, PLoS Comp Biol). We have now included a reference in the Discussion that more in-depth modelling will be required to determine the association of P. vivax replaces with different proposed relapse triggers. To address the reservations of the reviewers, we have now adjusted the way we include molFOB as a covariate in Cox models (Table 5). Instead of calculating molFOB over the whole follow-up period, resulting in a stationary measure of exposure for each child, we now calculate molFOB up to each follow-up visit (i.e. the average molFOB estimate as 'known' at the time of 'outcome'). Using this approach, our estimate of molFOB is time-dependent and the risk of clinical episodes is predicted using only exposure up to the time point of observation, without taking into account future exposure. A main focus of the manuscript consists in describing small ‐scale geographical heterogeneity in exposure to different Plasmodium species, and investigating how these differences in exposure translate to patterns in clinical incidence. To illustrate the geographical differences in exposure and clinical incidence between villages, we would prefer to keep the kriging maps in the main manuscript. However, if substantial concerns about presenting kriging ‐fitted maps in the main manuscript (along with the relative standard error) remain within the panel of reviewers, these maps may be moved to the supplement in the final version of the manuscript. In addition to including the full models in the main text to avoid selective reporting based on a cutoff of p<0.05, we have reformulated parts of the Results section giving more emphasis to effect sizes rather than p-values. We now give all confidence intervals also in the text with every point estimate to facilitate interpretation by the reader. We have now moved the full models from the supplement to the main text, and provide univariate (or in selected cases PQ treatment-adjusted factors) in the supplement. We thank the reviewer for their assistance in improving the manuscript and we are pleased that we have adequately dealt with all concerns. In response to the Senior Editor and reviewer 4 we have now included the kriging maps in the main manuscript file, although we remain willing to move to the supplementary material if necessary. We have now included molFOB in the models as time-varying covariate, as outlined above. We have now included the kriging maps, as outlined above. We have now rewritten the Results section to give more emphasis to effect sizes rather than p-values and we provide all confidence intervals in the text with every point estimate to facilitate interpretation by the reader. As outlined in response to Senior Editor comment 4, we have now moved the full models from the supplement to the main text, and provide univariate (or in selected cases PQ treatment-adjusted factors) in the supplement. We sincerely thank the children, their parents and guardians, school principals, teachers, and communities for their willingness to be involved in this study. We are grateful to the staff at Albinama Health Centre and village-based health workers for their assistance. We also wish to thank the field team, administration and laboratory staff at Maprik branch, as well as the molecular parasitology laboratory staff at Goroka branch of PNG IMR for their efforts in sample collection and processing. We thank Matthew Phillip for assistance with GPS data collection. We thank Amanda Ross for statistical advice, as well as Jessica Brewster and Cristian Koepfli for assistance with qPCR. Funding was obtained from the Swiss National Science Foundation (grant no. 310030–134889 and 310030–159580), the International Centers of Excellence in Malaria Research (grant U19 AI089686), and the TransEpi consortium funded by the Bill and Melinda Gates, the NHMRC (#1021544) and the Cellex Foundation. This work was also made possible through Victorian State Government Operational Infrastructure Support and Australian Government NHMRC IRIISS. LJR was supported by an NHMRC Early Career Fellowship #1016443. SK is supported by an NHMRC Early Career Fellowship #1052760. IM is supported by an NHMRC Senior Research Fellowship (#1043345). The funders had no role in study design, data collection and analysis, decision to publish, or preparation of the manuscript. Human subjects: The study received ethical clearance from the PNG IMR Institutional Review Board (0908), the PNG Medical Advisory Committee (09.11), the Ethics Committee of Basel 237/11 and was conducted in full concordance with the Declaration of Helsinki. Written informed consent was obtained from the parents/guardians of all children enrolled in the study. © 2017, Hofmann et al.